The success or failure of a project often hinges on buy-in and process. 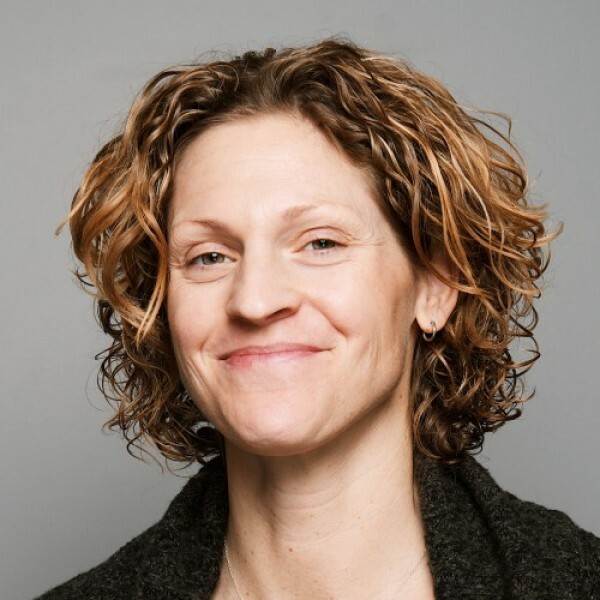 Director of Project Management Kim Koenig shares her time-worn advice in this article. One of the very first questions almost every client asks is how she should manage her internal team and stakeholders during the project - and when to involve them for approvals and overall project buy-in. Truthfully, it really varies according to the scope of the project, the size of the client organization, and as many other factors as you can imagine. But in a nutshell, we’d suggest you divide the organization into four “tiers,” or groups. 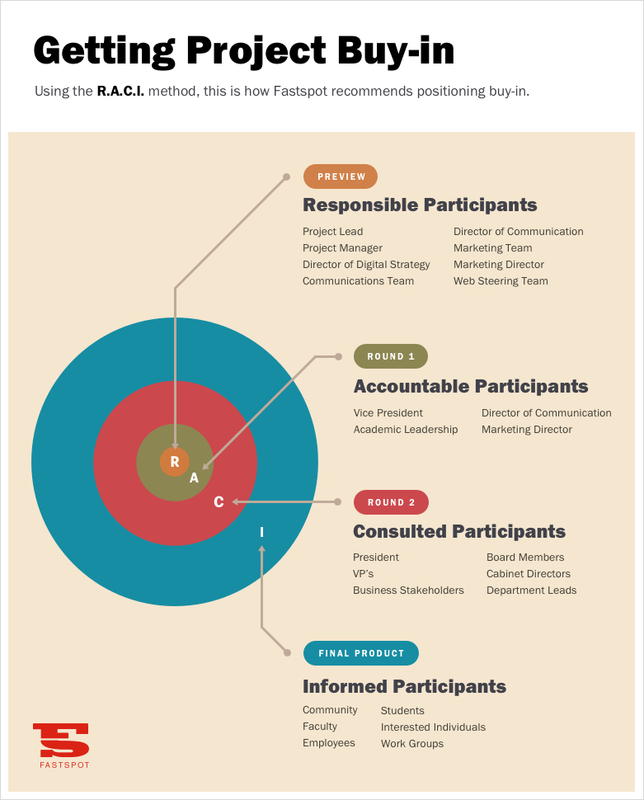 Think about these groups using the RACI methodology, which is a responsibility assignment matrix that can help you define participation and responsibilities by various roles in your organization. Responsible: The person(s) responsible for the day-to-day performance of the project. Accountable: The person(s) accountable for the outcome, whether positive or negative; this group presents the sole decision-making authority. Consulted: The person(s) who should be consulted throughout the duration of the work; they may provide advice as a subject matter expert and they should be kept in the loop and up-to-speed through the whole project. Informed: The person(s) who should be informed about outcomes or progress of the project and/or the final product. We require that our clients provide a single point of contact who will be the Fastspot project manager’s counterpoint for the duration of the project. This should be a person who is highly knowledgeable about their organization, and knows whom to pull in, and when, to keep the project on track on the client side. This person will be responsible for attending all meetings and weekly status calls and ultimately manage consolidating and delivering feedback on deliverables throughout the project. He or she will be the main communication corridor with the Fastspot team, so it’s a pretty significant responsibility and an important one. The second tier is preferably a slightly larger team or committee that has been tasked with oversight and extended collaboration for the web project. This group is commonly called the web steering committee, or something similar, and often exists before Fastspot gets involved with a project. This team will be accountable to give feedback, participate in exercises and workshops, and act as the eyes and ears of the community when it isn’t practical to have the entire client community involved. The third layer of participants in a redesign project are the folks who should be consulted for their expertise, as needed throughout the duration of the project. It’s important to note this group is most likely unavailable for the day-to-day decisions of the project, yet they have complete control to turn the project upside down. To this audience, we aim to deliver a more refined product (e.g. round two design concepts) rather than early iterations (e.g. design sketches). It’s imperative that the timing of this group's participation falls somewhere after collaboration has occurred between both teams and before we’ve utilized the full scope, so there’s still room in the approval process and budget to make further refinements or adjustments based on their feedback. This layer is tricky and needs to be strategically managed, but once this group is on board it should be smooth sailing in terms of getting the appropriate sign-off. The fourth tier is for “everyone else” who should or may be interested in the project. Generally this is the community, employees, faculty and/or students whom should stay informed with the finished product. This group of interested participants can act as contributors, testers or evangelists, as the project progresses. It’s not always practical to have dozens of people involved with the project on a weekly basis—they don’t have time, and getting a large group of people to agree on anything is quite impractical. But if you do have a wider group you can call on with content questions, for focus groups or eventually contribution to the redesigned site and intranet, it’s good to start cultivating those connections early. At the end of the day, it’s important to remember these are only guidelines. Every organization is structured differently and every client team will have a set of unique challenges that will need strategic guidance on how they receive the proper buy-in, from the right people, at the right time. We often err on the conservative side when we’re at a fork in the project and are determining who should be present for a presentation. The goal is to avoid involving someone 'higher up' before we’ve had time to collaborate and refine the product. However, the risk of involving them too late in the process is having to backtrack work to a previous iteration because the right people weren’t consulted sooner. We attempt to address this process with our clients in a casual manner - as these groups can also fluctuate through the different phases of a project (i.e. perhaps the president is only interested in the design and isn’t as concerned with the outcome of the information architecture, etc). Regardless of how perfectly you map out your organization's level of effort throughout the project - there will always be room to pull in that voice from the back of the room - and we’ll work with you to manage what we do with that feedback.